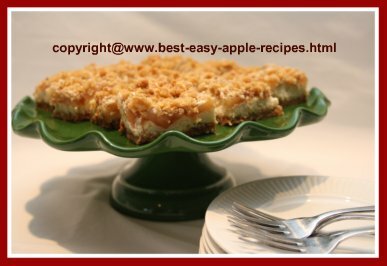 When it comes to baking bars and squares, it is a good idea to make Apple Bars Recipes. You don't feel as guilty eating the bars and squares when you know you are eating fruit when you are enjoying the scrumptious taste of these delectable treats! Apple squares, and bars, differ from cookies, due to the fact that bars are baked in a pan, not on a cookie sheet. When done, bars are cut into squares, rectangles, or diamond shapes by cutting them in the pan in which they were baked. Obviously, the yield of bar cookies depends on the size of the pan and the size of the desired serving. 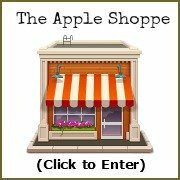 Check out the links below to find recipes for bars and squares which include apple fruit combined with other common ingredients to make the most delectable squares and bars! I am sure you will find something to inspire you to start baking with apples! And, keep checking back as I am constantly adding new recipes to this website! 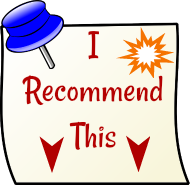 If you have an apple recipe that you would like to share, please send me the recipe (and a picture to accompany it if you have one...visitors love recipes that have pictures to go with it), using the contact me form at the bottom of the left hand navigation column. Thanks! To test to see if done baking, apple squares and bars should be checked with a wooden pick (toothpick). Generally, when a toothpick, inserted in the center of the squares in the pan comes out clean, the bars are finished baking. Fudge-like bars are done when a slight imprint remains after touching the bar tops lightly. If bars require frosting, they should be cooled before frosting, unless the recipe directions advise otherwise. Apple squares and bars can be used to compliment a mixed cookie tray, adding attractive texture and colour.